I found the following text in a guide specification from a building product manufacturer. A. General Locations and Arrangements: Drawing Plans and Details indicate general location and arrangement of underground storm and drainage piping systems. Location and arrangement of Storm Water Systems is critical and design consideration should be taken into account. Install Storm Water Systems as indicated herein and as directed by product manufacturer, to maximum extent practical. Where specific installation procedure is not indicated, follow product manufacturer’s written instructions. A. Install in accordance with manufacturer's instructions. The original language is self contradicting, vague, and redundant. More, the language about complying with drawings and specifications is assumed to be part of the Division 00 Contract Forms or Division 01 General Requirements. Which version would you rather bid on or attempt to comply with? B. All products shall be inspected for defects and cracks before being lowered into excavation, piece by piece. I suppose this means that the product must be cracked before installation. For tips on how to avoid making mistakes like these, I will be teaching a CSI Webinar on Guide Specifications on September 27. Watch for details. Can you produce evidence that you are "North America’s leading product marketing and architectural consultant"? This is such a broad and outrageous statement that it gives me suspicion that any consultation advice or information coming from Chusid Associates is likewise suspicious. But if it is true, I am quite impressed. I started describing Chusid Associates as "North America’s leading building product marketing and architectural technology consultant" about twenty years ago. The slogan was suggested by my father, a man with substantial marketing insight. "But," I protested, how can I say that? I have just a small business and there are lots of consultants with much bigger practices." Dad replied, "There are lots of way to be a leader. You can lead by providing valuable insight and outstanding service to your clients, by being at the leading edge of innovations in your industry, and by being the most creative." I learned a valuable lesson from my father, that day. And ever since, I have proudly described Chusid Associates as a leading consultant. It reminds me of the high aspirations I have for the work I do. To justify the claim of being "leading," my associates and I have to lead. It is a goal that inspires us to do our best. "Leading" has a range of meanings. Chusid Associates is leading in the sense of providing leadership or guidance, and advancing ideas that are often in the forefront of the industry. Each person can decide for themselves whether the description fits. There is also the sense of leading that means being first; when I began practice about 30 years ago, I did not know anyone else providing the type of focus on building product marketing and technical consulting. If you want evidence to prove the claim, speak to my clients. Most of them will tell you that Chusid Associates helps them create better business outcomes. Chusid Associates' work has also been recognized with awards of excellence from Construction Specifications Institute, Construction Writers Association, and other industry associations. Perhaps it is hyperbole is to call Chusid Associates "the" leading, rather than "a" leading consultant. This type of puffery* is acceptable in general marketing claims. For example, Coke does not claim to be "a real thing;" it is "the real thing," and most consumers understand it in context. When, however, I provide the specifications about Chusid Associates' credentials and capabilities I try to be objective and avoid exaggerated promotional claims. The claim that the company is a leader inspires me, every day, to do the best I can for my clients and to improve best industry practices in construction. Thanks, Dad, for providing such leading advice. * The United States Federal Trade Commission (FTC) defined puffery as a "term frequently used to denote the exaggerations reasonably to be expected of a seller as to the degree of quality of his product, the truth or falsity of which cannot be precisely determined." "We...have actually found the majority of the known objects,"
This linguistic gem was part of an NPR newscast about the potential for a collision between earth and a a "near earth object" such as an asteroid. It should come as a relief that we have already found what is known. It would be shocking to know objects that had not been found. Or if we failed to know objects that had been found. Yet figures of speech like this abound in building product technical literature. I once wrote that a water repellent "penetrates up to a quarter inch or more." While it sounds good as a marketing claim, it actually means nothing, since a material that lays on the surface would also satisfy this claim. Recently, I saw a product claim that "our material meets ASTM E84." This says nothing, because a test conducted according to the standard (for surface burning characteristics of a material) yields a numeric value, not a pass/fail criterion that can be met. Send me your favorite example of a product claim that doesn't say anything. "Asteroids Pose Less Risk To Earth Than Thought"
The commentator says, "I completely agree!!! Thought poses a huge amount of risk to the earth. Way more than asteroids." I was taught that construction specifications must be written not only to say what was meant, but in a way that can not be misinterpreted. Facade of building as seen from the street. Successful construction depends on clear communications, and this is facilitated by using words with commonly accepted meanings. Language must evolve in response to the changing needs of design and construction, and it is not uncommon for words to take on new meanings. Yet we should resist the urge to redefine a term when an appropriate alternative is already established. When architects design facades, we are concerned about the organization of shapes, color, massing, texture, ornament, and fenestration, and the experience of the public seeing the building. "Facade" may be acquiring another definition, however. I realized this while attending a "Facade Tectonics" conference at University of Southern California. They use the term to mean the materials, systems, and processes that relate to a building's exterior surfaces and appurtenances thereto, including the effect upon the spaces and occupants on both sides of the surfaces. Conference participants delivered papers about the thermodynamics, weather enclosure, and other performance considerations of facades, but scarcely used the word in it established meaning relating to the appearance of a building. • Enclosure: Used in ASTM E1557 - Standard Classification for Building Elements and Related Sitework-UNIFORMAT II, and in the OmniClass international classification system for building elements. • Envelope: Used by National Institute of Building Science (NIBS), publishers of Building Envelope Design Guide and co-sponsor, along with AIA, of Building Envelope Council. • Wall and curtainwall are readily understood terms. There is frequently a connection between a facade and an envelope. Yet the two their meanings are distinct. A structure on Main Street may have the same facade as one on a Hollywood soundstage, but the envelope of one is constructed of hewn limestone while the other is painted plastic foam. Marketing copy writers love literary flourishes -- a catchy headline, prose that elicits an emotional response, and even poetry. Yet building product literature is also a bastion for straight-forward technical elucidation. I learned this from Bryan J. Varner, CSI, CCCA, LEED AP, an attorney in Santa Rosa, CA. Bryan says that his arguments in court, even on technical points of law or interpretation of documents, have to be convincing to win over a judge or jury. Similarly, the technical arguments in product literature have to be convincing if they are to win over a skeptical designer, builder, or building owner. One does not need to resort to hyperbole or slogans to be convincing. Knowing what a designer or builder (or, a worst case scenario, a judge) needs to know, organizing your information thoughtfully, and using easy-to-understand prose can make a very convincing case. Good graphics - photos or technical illustrations that explain a technical point, can also help convince the skeptic. if it is to achieve "word of mouse". T.L.A. can be B.A.D. for B.P.M. Three Letter Acronyms (TLA) can be bad (BAD) for Building Product Manufacturers (BPM). Construction is a field where new technologies and practices often justify the invention of a new term. As an example, I coined the phrase, "studcast" to describe a new type of wall panel that consisted of a hybrid of prefabricated light-gage steel frame with a thin precast concrete veneer. I offered the term to all the manufacturers of this type of product, and most of them now use it to as a standardized, simple, and descriptive term. However, some invented terms are unnecessary and can lead to confusion. A case in point is the recently coined term, "civionics". I first encountered the term in the article "New civionics technologies for structural health monitoring" in the November 2010 issue of CE News. While the article shares valuable information about the evolving science of structural health monitoring. I question whether the use of the term "civionics" was equally valuable. The author, Nathan Yang, defines the term as "the synergistic combination of civil engineering, electrical engineering, computer engineering, photonics, and other disciplines for [structural health monitoring]. This definition suggests that "civionics" is an equivalent term for "structural health monitoring", a field that already encompasses a variety of disciplines. Indeed, electrical and computer engineering are already integrated into the practice of civil engineering. In this case, "civionics" is a word of of questionable value in a field already cluttered with jargon. A search of the CE News website reviews that "civionic" has not previously been used in the publication. Similarly, a search of the internet reveals that the term has few users -- most of its occurrences on the internet result from one site quoting another. A similar concern has been raised by a commentator on Google Talk who opines, "All of the references describe [civionics] as an emerging field, yet they seem to point in a circular manner as to establishing the notability of this term. Wikipedia is not a place to establish notability. So if this term is not widely used in the engineering field, it should not have an article here." Nor, in my opinion, should notability be established by an oblique reference in a magazine article. But marketing is marketing, and I note that the author of the CE News article works for a company that sells electronics to the Civil Engineering community. Maybe he feels his company will benefit from embracing new term. How ironic, then, that the term "civionic" does not appear in his website, either. This course will better inform the designer on quartz, the history and its relationship with quartz surfacing materials. Quartz has played a unique role in the history of quartz surfacing materials. Its unique properties have made it into an exceptional material in the building industry. This course will help you gain a general understanding of quartz the unique manufacturing process of Quartz surfacing materials. You will also gain insight on the differences between solid surfaces, stone surfaces and quartz surfaces. The first sentence mentions the relationship of quartz to the history of quartz surfacing. So does the second sentence. The statement that "Quartz has played a unique role in the history of quartz surfacing materials." is outrageously obvious. The word "unique" is abused by being used three times in this short paragraph, diminishing the word's impact. The fourth sentence would benefit from a conjunction so that it would read: "This course will help you gain a general understanding of quartz AND the unique manufacturing process of Quartz surfacing materials." There are other errors, too. See if you can identify them. If you are not a skilled writer, find an editor to check your work before sending it out. Argument is the worst sort of conversation. Try the experiment of communicating, with fullness and accuracy, some experience to another, especially if it be somewhat complicated, and you will find your own attitude toward your experience changing. In describing today's accelerating changes, the media fire blips of unrelated information at us. Experts bury us under mountains of narrowly specialized monographs. Popular forecasters present lists of unrelated trends, without any model to show us their interconnections or the forces likely to reverse them. As a result, change itself comes to be seen as anarchic, even lunatic. The colossal misunderstanding of our time is the assumption that insight will work with people who are unmotivated to change. Communication does not depend on syntax, or eloquence, or rhetoric, or articulation but on the emotional context in which the message is being heard. People can only hear you when they are moving toward you, and they are not likely to when your words are pursuing them. Even the choices words lose their power when they are used to overpower. Attitudes are the real figures of speech. increase your investment in your kitchen." That is true. Installing gold-plated faucets would increase the investment even more. Perhaps they meant to suggest the the home improvement project would increase the "value" of a home, or that mouldings offer a good "return on investment." How often do you fail to hear a buying signal, a sign that a prospect is ready to become a customer? "... Mrs. Schuller called her husband’s attention to an article ... illustrated with photographs taken at [a] project designed by Philip Johnson. Neither of the Schullers had ever heard of Philip Johnson, and at the time they assumed him to be a landscape architect. 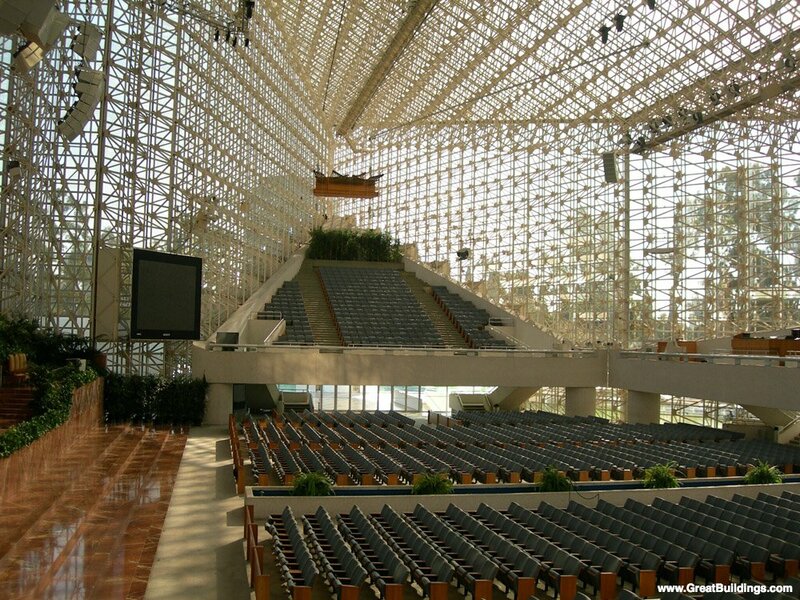 But a week later, back in Anaheim, Schuller read a magazine article that listed Johnson among the world’s leading architects. Schuller was looking for an architect to design his new church ... and the coincidence of coming across Johnson’s name twice in one week seemed reason enough to call him up. He did so the next time he was in New York, but Johnson was out of town and [his partner] Burgee was out to lunch. Schuller left a message with Burgee’s secretary, saying that he would like to talk to them about a job. When Burgee got back from lunch, he assumed that Schuller wanted to come to work for the firm, and he told his secretary to dodge him. But Schuller turned up at the office without an appointment, and Burgee discovered that the “job” was a multimillion-dollar church." Excerpt from New Yorker. When telling someone about this website, I explain the address is, "building product marketing dot com, written as one word without spaces or punctuation." "Written as one word without spaces or punctuation" has become common in daily language as we exchange e-mail and website addresses. To my ear and tongue, the phrase sounds and feels clumsy and inefficient. Fortunately, there is a more elegant way to say, "written as one word without spaces or punctuation," and that is the Latin phrase "scriptio continua." I believe it its time to bring back the term. It allows me to say, simply and concisely, "Visit my website at building product marketing dot com, scriptio continua." My proposal will not work, however, if I have to explain "scriptio continua" every time I use the phrase. One person, alone, cannot change the language or reinvigorate an archaic term. But working together, it can happen very quickly. If you feel my proposal has any merit, I invite you to embrace and use "scriptio continua" in your spoken communications. More importantly, please use the power of social media to spread the word about "scriptio continua." Repost this on your blogs and facebook page, twit it, digg it, share it with the other tools of cybermedia to make "scriptio continua" part of our common language. P.S. A Google search on "scriptio continua" today returns about 24,300 hits. I will report changes in this result from time to time on this blog. Saw a post challenging ad agencies to describe their firm in 6 words. The benefit of the "Six Words" is the same as an elevator pitch, but in more condensed form. It really forces you to identify your core message and target. What are your six words? Leave them in the comments below. Whatever you are doing, STOP. Take three minutes to see the future of computing. What will this mean to the way architects, engineers, builders, and the public select, purchase, and use your building products? What will it mean to the future of your company and how you do business. This is not something over the horizon; this moves the horizon. “In the past, just about every advertiser has assumed that in order to sell his goods he has to convince consumers that his product is superior to his competitor’s. “This may not be necessary. It may be sufficient to convince consumers that your product is positively good. If the consumer feels certain that your product is good and feels uncertain about your competitor’s, he will buy yours. “If you and your competitors all make excellent products, don’t try to imply that your product is better. Just say what’s good about your product – and do a clearer, more honest, more informative job of saying it. Anything that goes on the web is permanent, which means when mistakes happen – and they will happen – there is no way to undo them. So how can you fix them? Admit the mistake and issue a correction. Admitting your mistakes builds trust with your clients and gives you a chance to apologize, if necessary. It also gives you a chance to respond before your competitors do, playing a type of proactive defense. As an added benefit, search engines tend to prefer newer results for a given search, making it likely that people will see the correction before finding – and acting on – the erroneous information. I have increased respect for STRUCTURE magazine because they did just that last week. An email announcing a new online video about BIM was sent to their mailing list before the video was available on the webpage. This is a good example of the need to double check that information is ready for release before posting, but more importantly within three hours the staff had noticed the mistake and sent out a correction via email. This simultaneously prevented the inevitable flood of “broken link” emails from readers and provided an additional point of contact, reinforcing the positive message that STRUCTURE is responsible and responsive to their readers. It takes a lot of courage to admit when we are wrong; most of us don’t like to admit our mistakes, preferring to cultivate an image of competent perfection. But the truth is mistakes happen, and how we deal with them says a lot about who we, and our companies, are. "parti: Choice, means, or method. In architectural criticism the parti is the assumption made that informs a design as well as the choice of approach when realizing the scheme. It is the BIG idea. To complete an architectural project, there must be a beginning. This can be the most difficult task in designing a building. Architects sometimes invent a strategy before beginning a project. This is called a parti. This word is from the French language and is a derivative of the verb for departure. In other words, a parti is a beginning. Once a parti is established, it serves as the organizing idea behind the rest of the project. This can include everything from the organization of the spaces to the elements used as decoration." The word is mostly used by what I call "capital A" Architects (and "capital A" Academics), not necessarily by the individuals who are doing the construction documents or selecting products. Now you know, and can do your part for the parti.